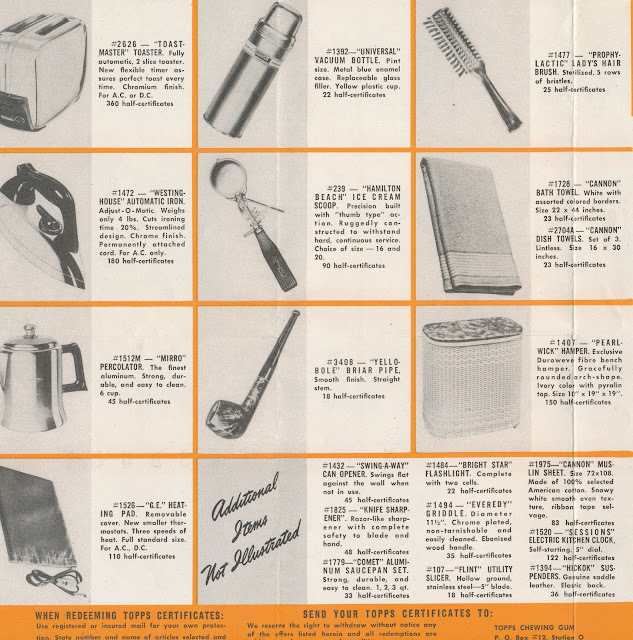 No, not Supplemental Security Income but rather a Sound Selling Idea for the typical retail shop owner circa 1950. 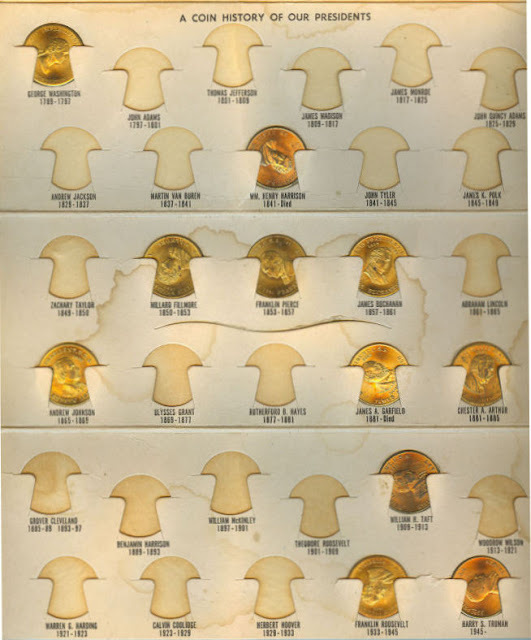 I've covered the Topps Premium Certificates here before and now I have a nice catalog to show what was available to Joe Shopowner. I suspect this was a 1949 publication as it came with a bunch of Certificates that expired in 1950. It's an 8 page accordion style flyer, although I have gone with a four page presentation here. 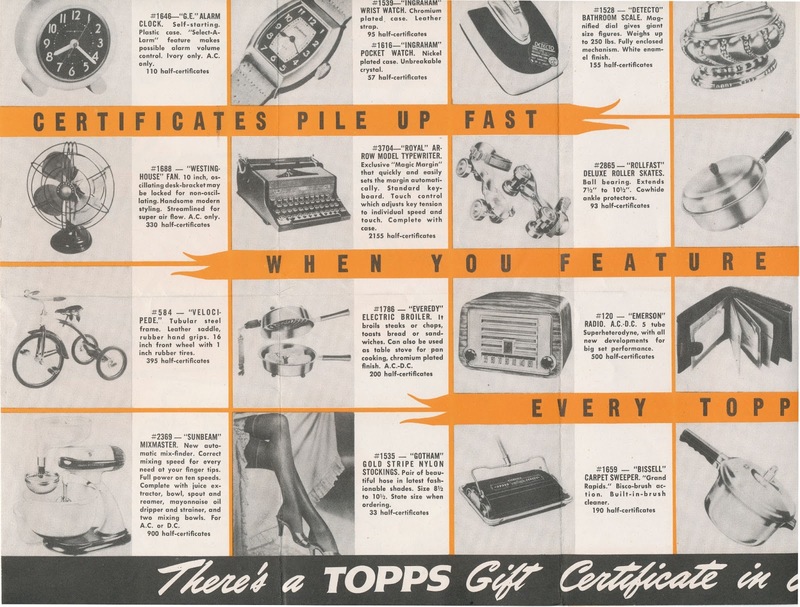 2,155 half certificates for a type-writer?! 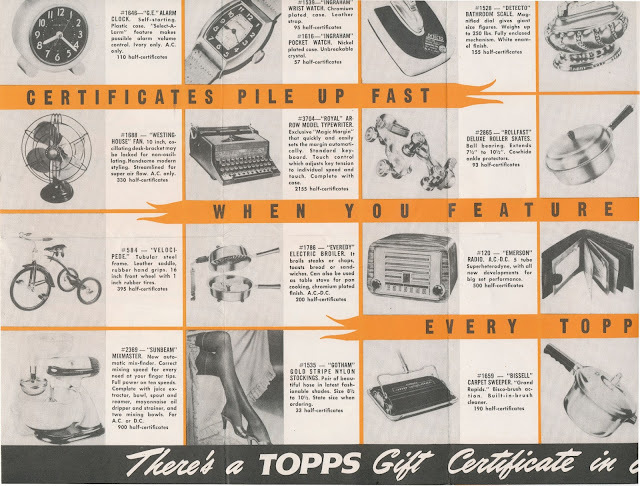 With one half certificate per box, and say 24 boxes per case, you would need to sell 180 cartons of Topps products to get the typewriter-yikes! Considering how extensive the retailer certificate program was and how thin profit margins often were, it's amazing Topps was able to make any money but indeed they did. 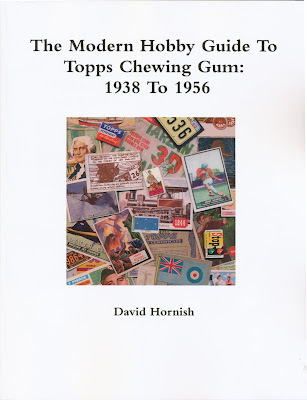 Now that I've finished off my book and before I embark on my next major project, I've been mining my hard drive for images of interesting and oddball items that I saved a while back and never really got around to showing. I also like to show some Bowman images every once in a while and today's subject qualifies in spades. 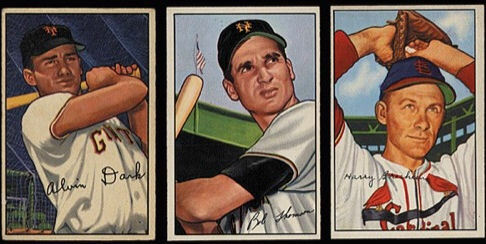 In 2009, Robert Edward Auctions listed a 3 card grouping of what they termed 1952 Bowman prototypes. 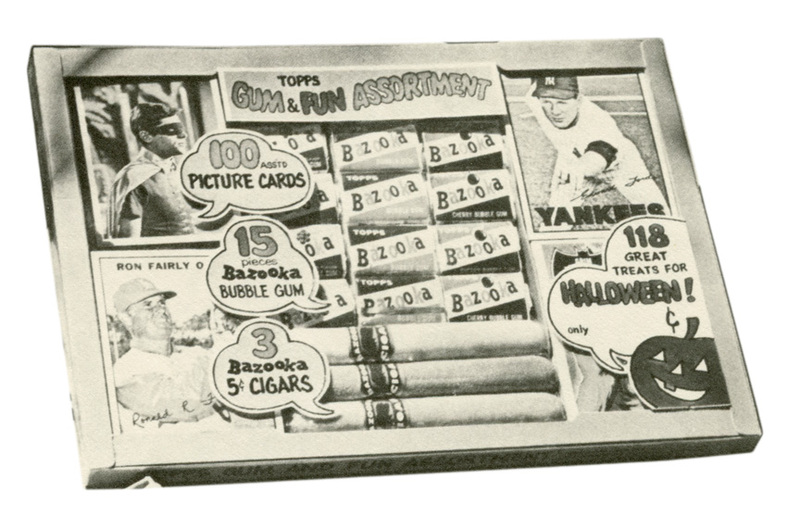 These were black and white photographs of subjects that appeared in the 1952 Bowman Baseball set. 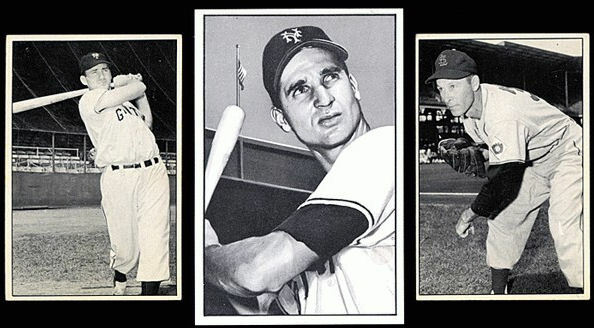 The two on either end are the same size as the 52 Bowmans, the middle one of Bobby Thomson has dimensions that match the larger 1953 cards. As you can see Alvin Dark's issued card in '52 differs in projection from the prototype and the Harry Brecheen photo was not based upon his 1952 card. Thomson's projection is also slightly different and looks like someone retouched his face a bit for the prototype. 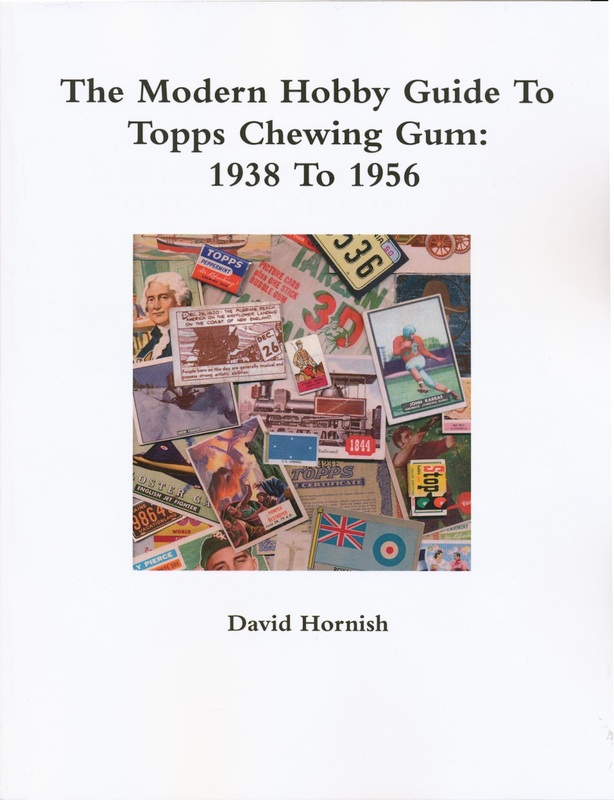 There are notations on the Thomson back that reference 1952 and it's worth noting he did not appear in the 1953 Bowman set so these certainly seem to be bridging the gap between sizes. 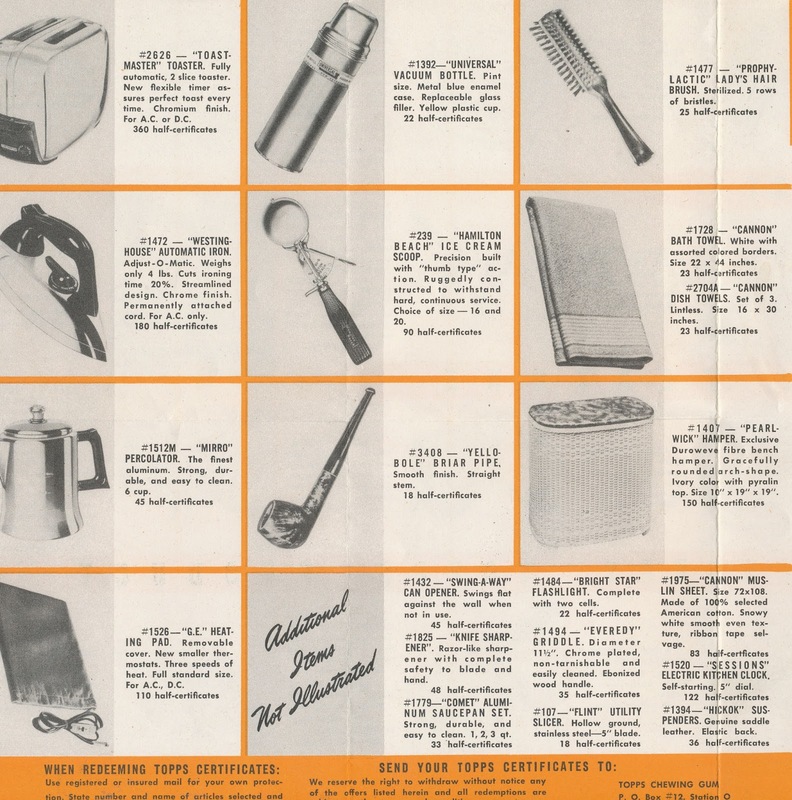 The prototypes were from the George Moll estate (Moll being head of their ad agency). 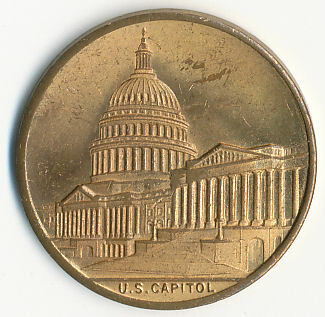 A small circular piece is missing at the right top (and possibly two are gone from the bottom) but it looks in fine shape otherwise. 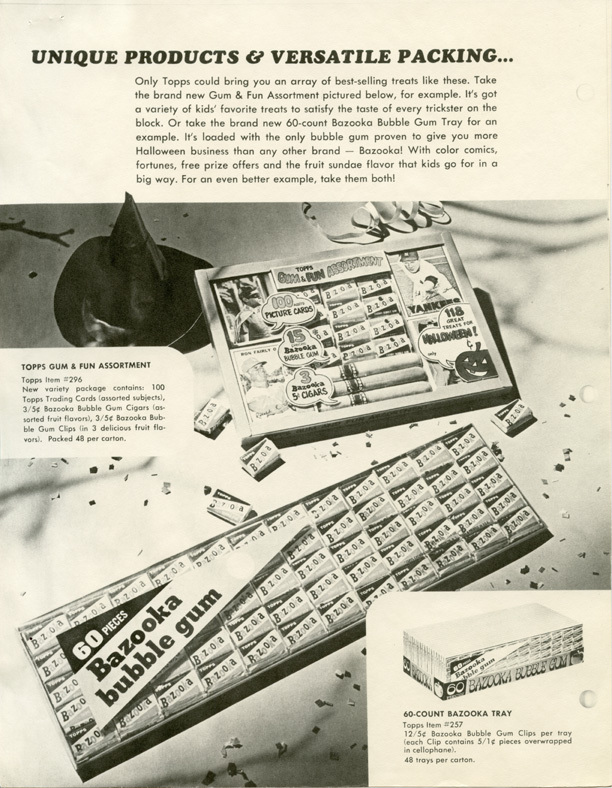 The gum tabs are described as the 1946 versions so the display looks to be a post-World War 2 piece. Topps had patented a similar wooden display case about five years earlier so I guess this was the natural progression. 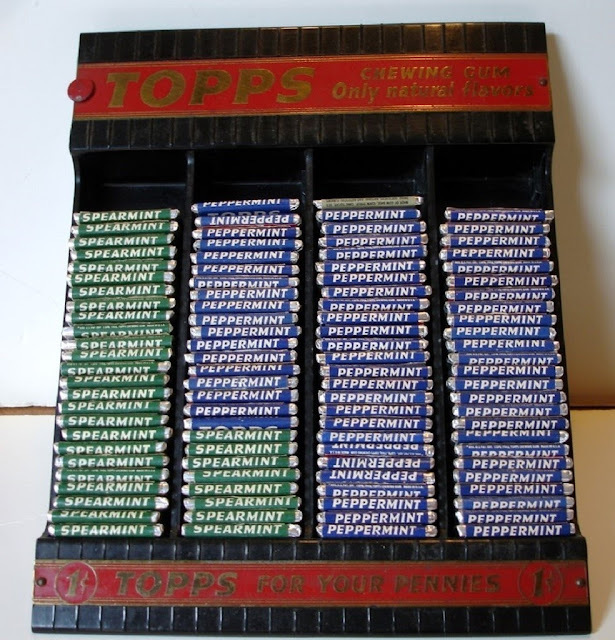 Can you spot the lone gum tab that is not Peppermint or Spearmint? The print on demand version is now available from lulu.com. You can click the link below or off to the right in the Link list. The books are printed and shipped by lulu; I do not handle them at all. Thanks for your interest! 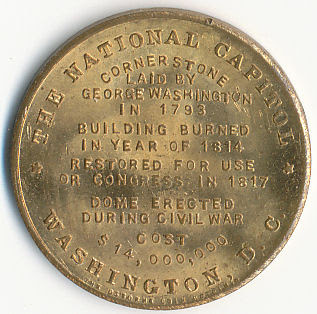 Firstly, there is a type as the coin reads "Restored for use or Congress in 1817" when the "or"should be an "of" but the bigger surprise is the Osborne Register company indicia at the bottom (under "Washington"). 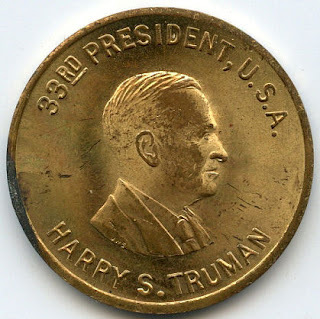 So far as I am aware, the Osborne Register company information was not on any of the President coins in 1948 but instead was added in 1953 when the board game Meet The Presidents was issued. 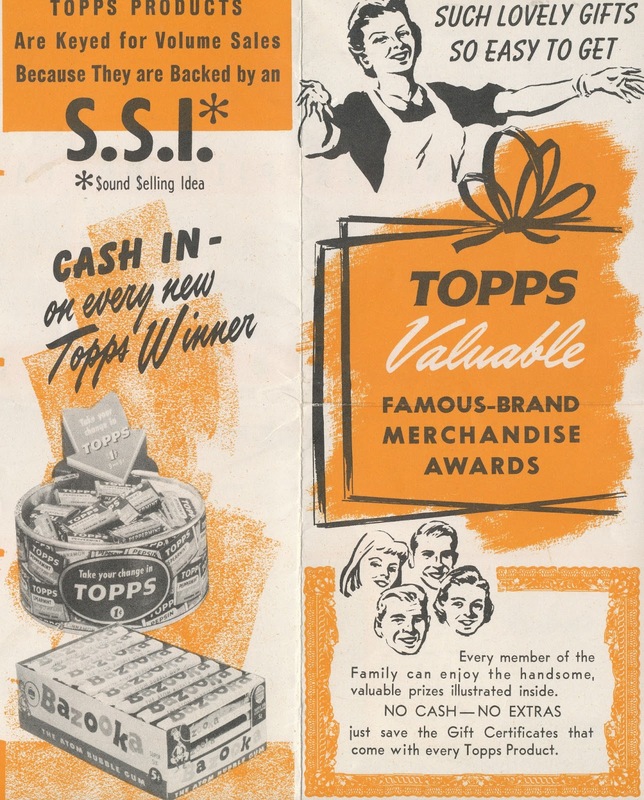 That game was originally a Topps for Toys product in 1949 but a Selchow & Righter property in 1953. Topps experienced returns of Golden Coin in 1949 so this could have been a way to move the product four years later, when the next election was occurring. 2) A variant Harry Truman coin, without or with glasses. 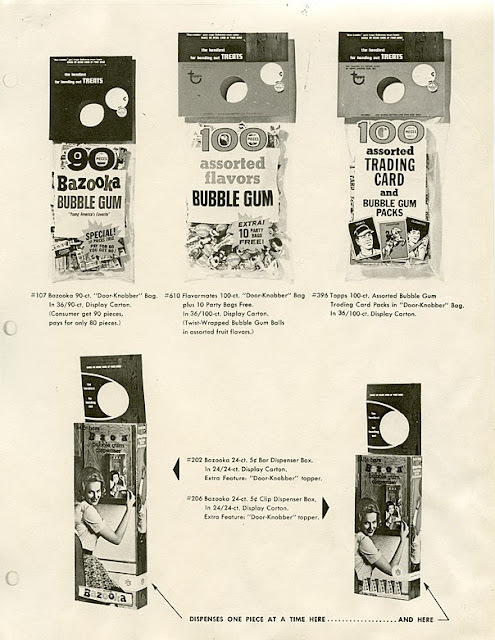 Jeff S. confirms the no glasses version came along with a folder album while the coins with glasses came from the 1949 Topps for Toys Meet The Presidents game. 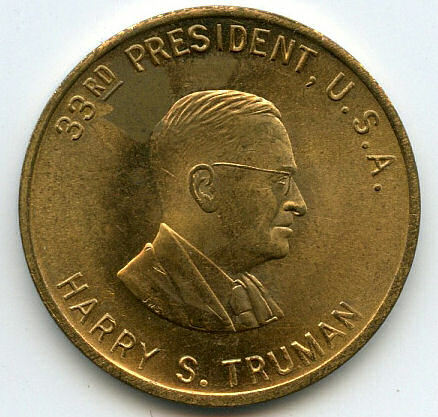 It would seem then that the Truman with glasses was an update. 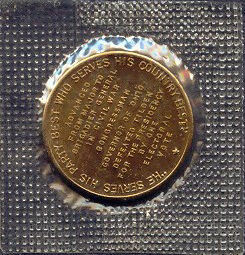 And what of the "bright border' coins found in cello overwraps that are in a slightly different style than the 48's, although I am not sure these are confirmed as a Topps product. I am still trying to cipher these. 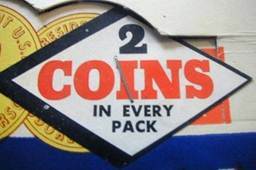 One thing's for sure, Golden Coin is one tricky issue (or three) to get a grip on! A couple of posts ago I dissected a 1965 Topps Halloween catalog, which was chock full of vintage goodies, mostly Bazooka related. 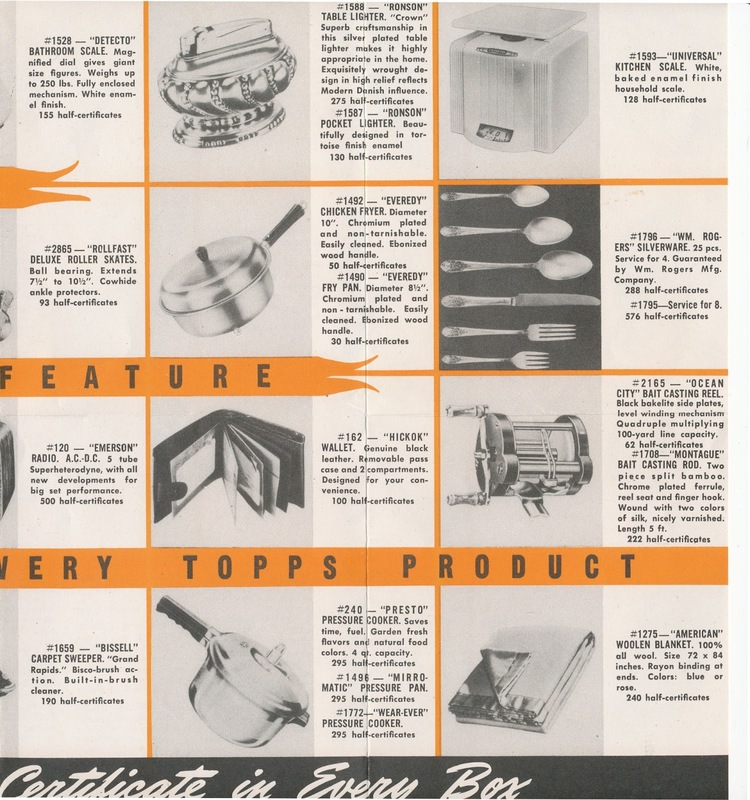 Today I have a 1967 Halloween Catalog, which looks like a partial and is in black and white but it's OK because there is a BIG surprise within. 100 cards, half of which look like 1967 baseball and the other half 1966 Batman's (Riddler Backs and one of the illustrated sets), both likely in cello wrapping. 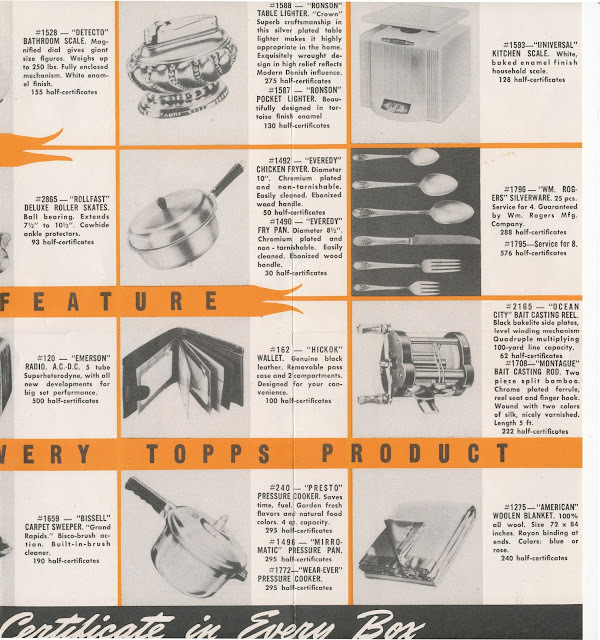 It's quite interesting they were already selling off their overstock on the current year's baseball cards at a time when the high numbers were still being sold at retail. 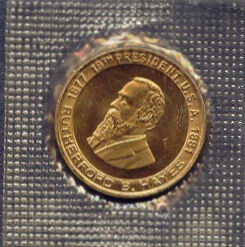 I have never seen one of these in the wild; it would be a sight to behold if one surfaces, wouldn't it? !